Our team features the greatest legends of Street Art and Graffiti from the 1970s to modern day and from across the globe. It will take all of their experience combined to tackle the job of transforming these dangerous fortifications on a deadline. The complexity of the project - painting these forts while living at sea - has never been attempted. There's sure to be creative competition and collaboration. Dangerous work mixed with extreme living conditions, we're confident this will be a ground breaking project at the intersection of art, film, technology, and history. Tristan is the creator of the PAINTED OCEANS project and artist team captain! Tristan has had a 20 year long career which has taken him around the world and through many creative fields. After doing graffiti in Detroit and Brooklyn, Tristan helped launch legendary art toy company Kidrobot which got him a place in the MOMA permanent collection. Shortly after, Tristan founded his Creative Agency Thunderdog as well as his guerrilla art group TrustoCorp which lead to global headlines and an ever growing fanbase. Tristan currently has large-scale murals in over 20 countries and hopefully a few more soon in the middle of the North Sea! World renowned for his iconic Barack Obama ‘HOPE’ poster and his subversive ‘Andre the Giant has a Posse’ street art, Shepard is one of the most famous and prolific street artists of our generation as well as a socially concious activist. You can see his work globally from stickers on the street and giant murals to galleries and museums everywhere. Shepard is no stranger to making history, so he’ll be right at home of the Red Sands Sea Forts. Futura 2000 is a god of Graffiti Art. 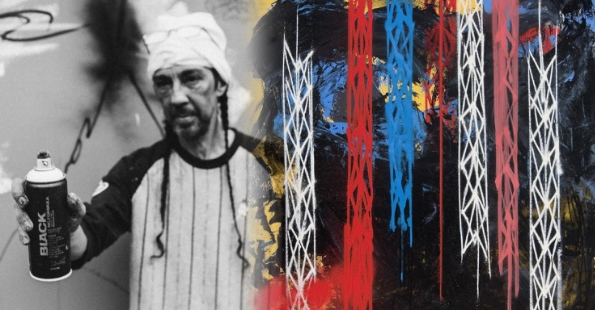 Since painting subway trains in NYC in the 1970s, Futura has consistently broken new boundaries and blazed a trail for 40 years of artists coming up behind him. From touring with The Clash to innovating Street Wear culture, Futura has gracefully stayed at the forefront of urban art culture. Futura also joined the United States Navy in the 1970s which gave him a special affinity for military aesthetics that will be very welcome on the Sea Forts. These two infamous twins are Graffiti legends and are now creative giants in the art world. They hail from Germany and bring a unique perspective to the history of the Red Sands Sea Forts which were built to shoot down German Aircraft. How & Nosm painted subway trains in countless countries before turning their attention full-time to painting and large-scale murals. Their unique style is unforgettable and can be found on massive walls around the world as well as upscale galleries and museums. Chaz and Bob of The London Police are some of the most prolific and beloved artists in the global Street Art community. TLP have been as consistent as they are ahead of their time stylistically as well. Since the early 90’s TLP have had their notorious ‘LAD’ characters gracing the walls and ‘top spots’ of major cities everywhere from Tokyo to Amsterdam, yet they’ve been able to evolve and change in a way that keeps their fans locked in at every turn. TLP are also the only ‘Brits’ on our team, so we’re hoping they’ll bring an element of class to our film and hopefully a few cups of tea.